Indian oil is looking to recruit fresher Indian graduates and diploma holder for Jr. Engineer job profiles. IOCL Recruitment department issued an official notification related to this recruitment process. Those who are interested in making their careers in Indian Oil organization can apply online for these Engineering jobs. We took this information from the official PDF file which was shared by the Indian Oil website. In the PDF file department said that they are looking for 40 fresher engineers in the company. More information related to this Indian Oil recruitment process is given below in this article. Read the whole article carefully before moving to online application form. Pay Band: Rs.11,900-32,000 per Month. BSc Graduates can also apply for these posts too. Age Bond: Applicant age must be in between 18 years to 26 years for applying these Government jobs. 5 years age relaxation for SC/ST and 03 years age relaxation for OBC candidates. What is the application Fee for applying this Indian Oil Recruitment 2018? Candidates who are interested in making careers in Indian Oil can apply for these jobs by paying ZERO application fee. All Indian candidates can apply without paying fee. 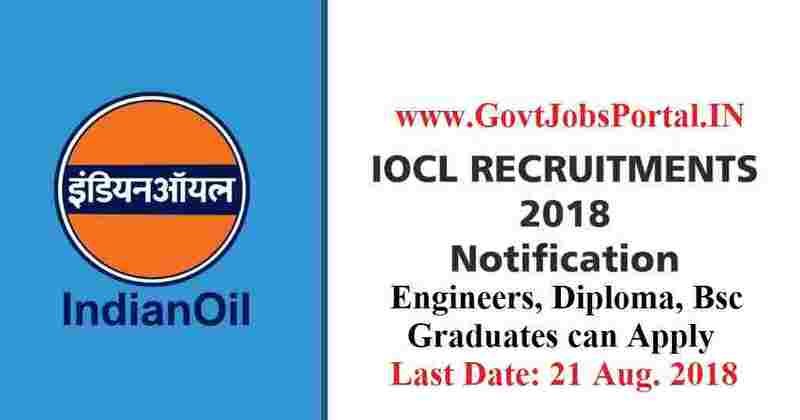 How we can apply for this Indian Oil Recruitment 2018? 1. Candidates must have a valid E-Mail ID and mobile Number for future communication up to the period of 12 months at least (including issue of call letters). 2.You should have the applicable documents/documentations pertaining to age, qualification, caste, experience, Disability Certificate (where applicable), scanned copy of colour photo and signature in jpg format (size not exceeding 50 KB) ready before applying on-line. 3. Applicants meeting with the complete eligibility criteria for the various posts can visit to the official website of IOCL “ www.iocl.com “ and apply on-line. Fill up the online application form with your detail same as your documents. 4. After successfully applying / registering on-line applications, the candidates must take a printout of the filled in online application form. The printout along with all supporting documents under self-attestation & a photograph as mentioned in the check list attached to the application form including proof of payment of application fees (if applicable) is required to be sent by ordinary post to The Advertiser, General Post Office (GPO), Post Box. No. 145, Bhubaneswar – 751 001, duly signed by him/her so as to reach us by 30-08-2018. Applications sent through Registered post / Speed Post / Courier shall not be accepted by the Post Office. 1st Aug. 2018 is the Starting Date for Applying. 21st Aug. 2018 is the Last Date to apply.